A hidden factor will dictate the economic future. If you are holding gold or precious metal mining shares your future is brighter than you may think. Even with all the obvious logical reasons to own these assets, there is another compelling reason to own precious metal mining shares. The current slow economic rebound in the United States and the persistent high levels of unemployment will not be solved by: 1) more government spending; or 2) printing more money. The reason is buried in the 1950-1975 time period. The employment rate (not unemployment), which was the percent of the population that held a job in the 1950-1975 time period averaged only 31% of the United States population. From 1976-2012 the average employment rate jumped to 44%. The U.S. economy was relatively doing very well during those 25 years from 1950 to 1975. The economy had its ups and downs, especially from the Arab oil embargo and a severe 1974-75 recession, but the country managed to right itself. But the 50’s and 60’s were great decades of growth and prosperity. During this period the country got by with only 31% of the people working. There were no shortages. Life was pretty good. Butchers and bakers and candlestick makers could afford a home and a new car every 3-4 years and send kids to college, especially in the 50’s and 60’s. Wages and salaries went a long way. Because of the huge distortions in the economy created by higher paper money infusions from the late 60’s onward, the entire U.S. economy was thrown into a slowly evolving disguised prosperity from this easy money. It finally unraveled in the crisis of 2008-2009. Look carefully at this graph. We do not need 44% employment in the U.S. We only need 31%. Therefore there is a huge employment gap. This gap cannot be maintained and that means very high unemploymentrates for years to come. This is what will throw the politicians into a frenzy because we have too many employed to begin with and very high persistent unemployment. 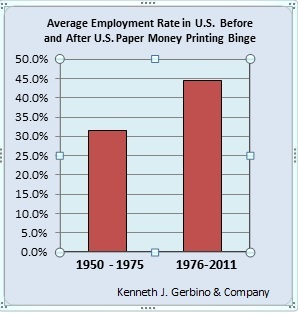 Many employed have been working in jobs that have been artificially created by all the paper money printed. Since the unemployment rate is so crucial to politicians, they are trying to get the unemployment rate below 5% which is proving to be impossible. Why? Again look at the graph. The big change between the two time periods was enormous amounts of paper money injected into the economy creating distortions by massive misappropriation of economic resources. Proof of this massive distortion is in the numbers. 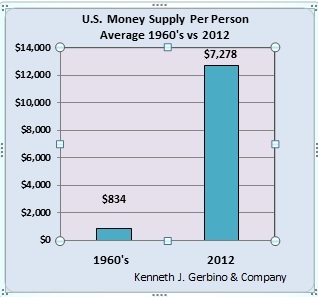 In the 50’s and 60’s the money supply (M1) needed to satisfy a growing economy where people had plenty of spending power was an average of $125 billion during these 20 years. That was it. There was no shortage of money or progress. Times were good. Today the money supply is 20 times higher at $2.5 trillion and most people are stretched financially. The difference between a 44% employed artificial economy and a 31% employed normal economy is an unsustainable 13%. This extra 13% of the American population working is not needed to provide the goods and services needed. Therefore the actual and non-disguised unemployment rate in the U.S. should be and will be closer to 20%. There are really not that many jobs needed to maintain the level of goods and services required by the population. When one factors in the cheaper goods from China and other countries and the labor and time savings of computers and robotic technology this problem becomes even more acute. This presents an untenable situation for politicians. Therefore the solution to this “hidden” problem is going to be for the powers that be to continue to print and borrow as much money as is needed to accomplish getting people back to work. It means providing extraordinary amounts of new money and high debt levels by the government. This will create even more economic distortions - all in the hope of finally handling the unemployment problem, which cannot be handled at this time and to increase “economic” activity. Politicians and the Federal Reserve, in order to “revive” the economy and bringunemployment back down to the 4-5% level will continue to print more and more money to no avail and this will bring on an inflationary economy beyond what anyone is expecting sometime in the future. This inflation will further erode the purchasing power of the lower and middle income wage earners as well as most white collar workers. Inflations can start quickly and violently. The result of this situation will lead to one of the greatest inflationary periods the United States has ever experienced. It means that precious metal investments are going to respond to this dramatically. It also means the bond market will become the next crisis point. High inflation means higher interest rates, the death knell for medium to long term bonds and most annuities. There has been much talk about how relatively low inflation rates are in the U.S. compared to the massive money supply increases the last ten years. One thing we know is almost all everyday items we all buy are up significantly in the last five years. The official inflation numbers are tweaked and “quality adjusted” as disclosed by the Bureau of Labor Statistics, the official government agency tasked with reporting this economic indicator. Inflation always catches up with the new money, so that time is coming. The argument that most of the new money is not really “in the economy” but sitting in bank balance sheets, propping up their liquidity and solvency is not true. Think about it. If a bank needs $10 billion from the Feds to stay solvent because they have $10 billion in bad loans, what does that tell you? They lent out the $10 billion already! That money has been lent out earlier and has indeed been circulating in the economy. Whatever is sitting in bank balance sheets from bailouts is there because a similar amount of money went out the door already. All the new money created in the United States has not created prosperity. You do not have to be an economist to recognize that a 900% increase in per capita money supply since the 1960’s has not even come close to a 900% increase in the amount of goods and services a wage earner can afford. In fact, this graph is an indictment of paper money and its negative consequences on the common man’s take home pay. The printing of paper money has destroyed the purchasing power of the lower and middle class because of this 900% increase in per capita money supply. Economic life was good in the 60’s for the average blue and white collar worker in the United States. The purchasing power of “take home” pay was significantly higher at that time. The increase of paper money has robbed them of the purchasing power of their savings and hard work. More money printed per person has created more poverty, not less. It has created more waste in government and more people dependent on the government for help. Workers used to be able to buy homes and send kids to college and save money in the 1950-1970 period. Today they are stressed out, working two jobs and having a tough time making ends meet. The printing of paper money has given free enterprise and capitalism a bad name to the lower and middle class wage earners as well as most white collar workers since they are all having a tough time getting by. Socialists use this as an argument against capitalism and free markets, when the real target of their discontent should be the printing of fiat paper money - which ironically is the socialist solution! The commercial banking system and the government are to blame for this fiat money travesty, not corporations, private business and some Wall Street investment houses. Get rid of the printing presses and the ability of the government to borrow money created out of thin air by the Fed and banking system and you will have once again a prosperous nation. The Federal Reserve has committed to buy $85 billion of new mortgage and federal debt every month in 2013. That is another potential trillion dollars that will be added to the money supply. The first thing to realize is that the world is not coming to an end but it is going to become very expensive. Owning gold and silver mining companies will be an important investment sector for investors. The discounted values for the mining companies are about to end and a major and unprecedented bull market for companies that have quality precious metal deposits is coming. • We are overemployed in the United States, therefore, the unemployment level will be high for a long time to come. • Politicians will help the government spend more and print more to try to get the unemployment rate down and the so called “economy” moving again. • Along with the past paper money created the amount of new money needed will be extensive and set the wheels in motion for a high inflation rate future that could last many years. • The price of gold and silver should go up dramatically. • Bond investments of maturities past 6-7 years will be hit very hard as will annuities. • Investments in mining stocks with accredited resources in the ground should be accumulated.